The province of Quebec is famous for its unique language and culture within Canada. It’s well known as well as for the spectacular cities of Montreal and Quebec City. These famous Quebec cities are a wonderful visit in their own right. But to experience the true beauty of rural Quebec you must venture further east.This is where some of eastern Canada’s most dramatic landscape lie waiting to be explored. Following along the St. Lawrence River to where the borders of Quebec and Nova Scotia meet is the Gaspé Peninsula. 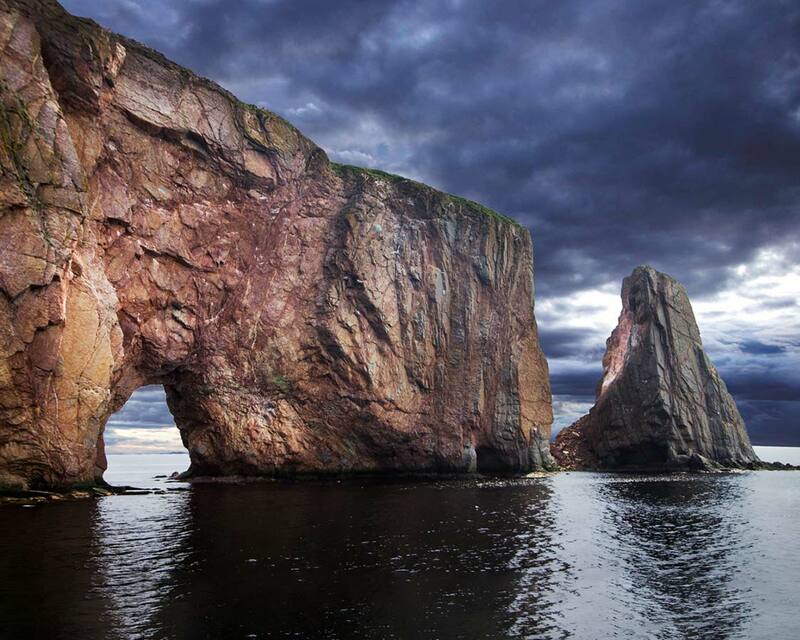 Here you can explore the beauty of Bonaventure Island and Percé Rock. The small town of Percé, Quebec, located at the tip of the Gaspé Peninsula is about 1,500 km North East of Toronto. Perce is about 1,000 km from Montreal or about 750 from Quebec City. No matter where you start from, a trip to Perce, Quebec makes for an epic road trip. We drove from Toronto on a road trip where we stopped every few hours to explore. The route along the St. Lawrence River is full of fascinating small towns. There’s no surprise why the route from Quebec to Perce along the St. Lawrence River made our list of the top road trips in Canada. You can check out that post here. If a road trip of that length isn’t your speed, and prefer to head straight to the Gaspe Peninsula, then you may want to opt for a flight into nearby Gaspé city. In Gaspe, Quebec you can join a tour or pick up a rental at the airport. Our first five days on the road that saw a fender bender, a transmission failure (that took three days to repair) and a speeding ticket (while trying to make up for lost time). We had finally made it to the apex of our trip on the Gaspe Peninsula, in the town of Perce. Our goal was to visit the incredible sights of Parc National de L’ile-Bonaventure et du Rocher Percé (Bonaventure Island National Park and Percé Rock). The National Park of Bonaventure Island and Percé Rock is relatively new, only being formed in 1985. 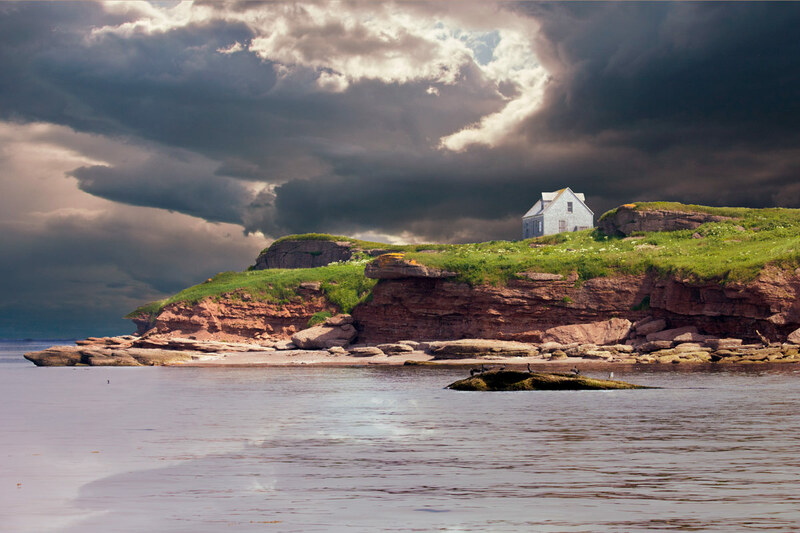 The two islands make up the dramatic views from the shore of the Peninsula Gaspesie. The history of the park goes much further back than this though, with the homesteads on Bonaventure Island dating back well over a hundred years. When Canadians talk about “The Rock” they are usually referring to the beautiful island province of Newfoundland located across from Gulf of St. Lawrence from the Gaspé Peninsula. In Quebec though, when locals mention “The Rock” or “Le Roche” you are regaled with stories of the spectacular monolith that sits off the tip of the Gaspé Peninsula. Poking out of the waters of the Gulf of St. Lawrence and is Percé Rock. Percé Rock measures a staggering 438 meters long (1545 feet) by 88 meters high (288 feet) making it one of the largest natural arches in the world. The Rock looms off the coast of Percé at just such an angle as to offer a natural light show at sunset. A number of companies offer boat tours of Perce Rock. Many of these also include a visit to nearby Bonaventure Island. The Perce boat tours take you all the way around the dramatic landscape, although they aren’t able to pass through the incredible Perce Rock arch. During low tide, a sandbar connecting the mainland to the rock is exposed allowing visitors the opportunity to walk from the coastline out to the rock. If you choose to hike to Percé Rock, it’s not recommended that you get too close as there is a lot of loose stone that can fall from the rock. During high tide, you can join guided kayaking tours. These tours last around 2 hours and allow you to get very close to the rock. This would have been our first choice, but since we were traveling with our two-year-old, we opted for the family-friendly boat cruise. If you prefer your feet to stay on firm ground, fear not, Percé rock stands proudly above the water as you approach the town and can be admired from much of the coast. Bonaventure Island is situated not far from Perce Rock. In fact, it is still easily visible from the shores of the town of Perce. The island offers beautiful hiking trails. 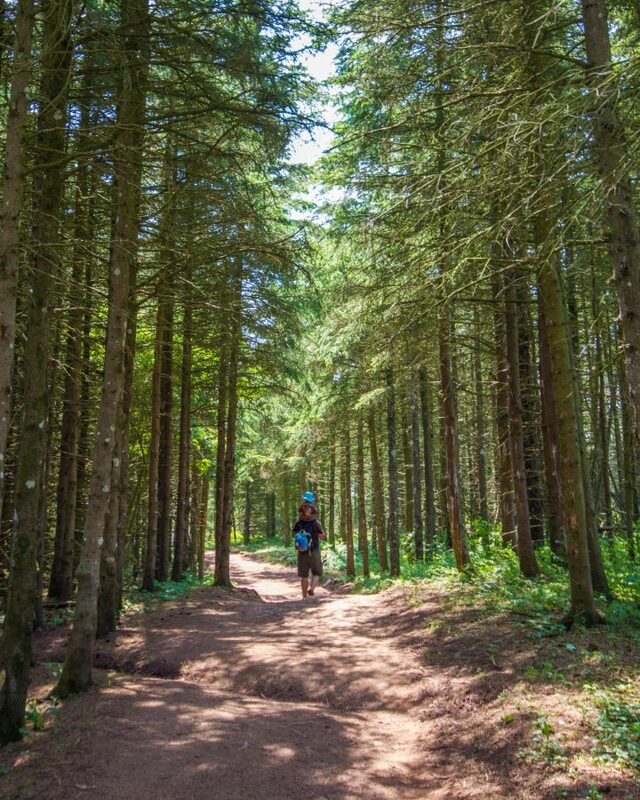 There are 15 km of trails stretched across four unique hikes through the island. None of them take you too far from the water though. The hiking trails on Bonaventure Island go through meadows, fields and evergreen forests. But the most exciting part of Bonaventure island is that it is a birding paradise! 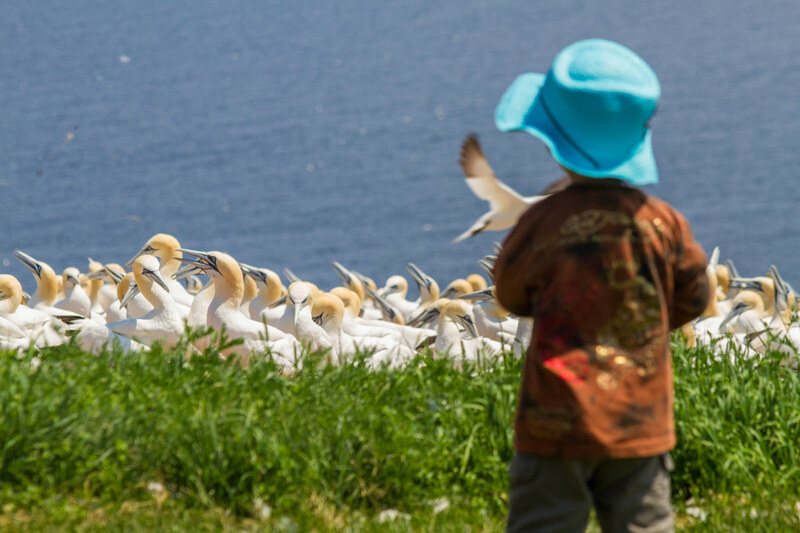 In the summer months, Bonaventure Island is home to the largest colony of Northern Gannets in the world. 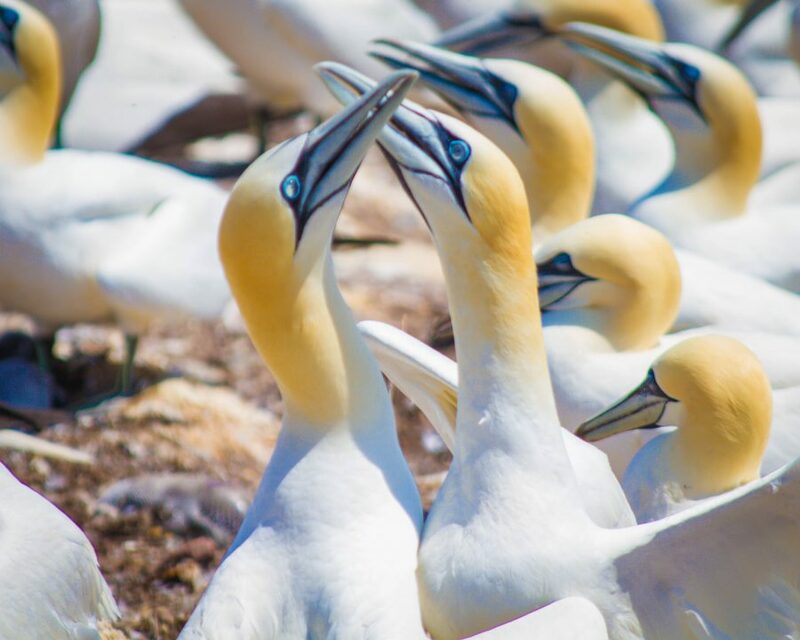 Over 60,000 gannet couples flock to the island to breed along with 11 other species of seabirds. After disembarking from the boat, (you could also choose to stay on the boat while people disembark if you are only interested in the ride and water views) we walked along a boardwalk to reach the Visitor’s center. The Visitor Center on Bonaventure Island contains a small cafe. This is the only source of food or drinks on the island. Visitors to Bonaventure Island can stay on until the last boat departure, which for us was 5 pm. All hiking trails on Bonaventure Island start at the Visitor’s center and end at the bird cliffs on the far side of the island. As this would be C’s first hike, we chose to hike the Des Colonies trail as it was the shortest. The path was well marked, mostly flat, but uneven in parts. It was less than 3 km. C decided that he would take this opportunity to begin his love for hiking, so it took us almost an hour. Our little guy hiked the entire trail in both directions, not bad for a two-year-old! The Visitor Center on Bonaventure Island contains a small cafe. This is the only source of food or drinks on the island. Visitors to Bonaventure Island can stay on until the last boat departure, which for us was 5 pm. All hiking trails on Bonaventure Island start at the Visitor’s center and end at the bird cliffs on the far side of the island. As this would be C’s first hike, we chose to hike the Des Colonies trail as it was the shortest. The path was well marked, mostly flat, but uneven in parts. It was less than 3 km. C decided that he would take this opportunity to begin his love for hiking, so it took us almost an hour. Our little guy hiked the entire trail in both directions, not bad for a two-year-old! 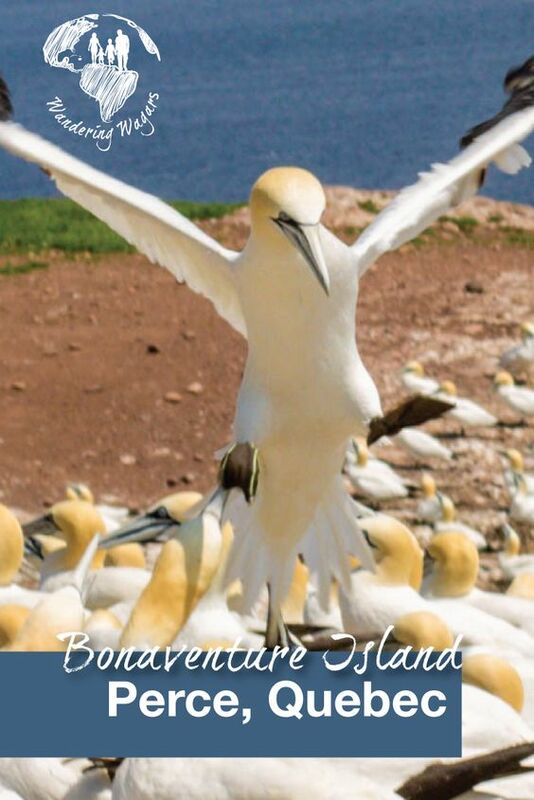 To say that the Northern Gannet Colony on Bonaventure Island is impressive is an understatement. Coming out of the tree’s and seeing the colony is like stumbling upon an ocean of birds. 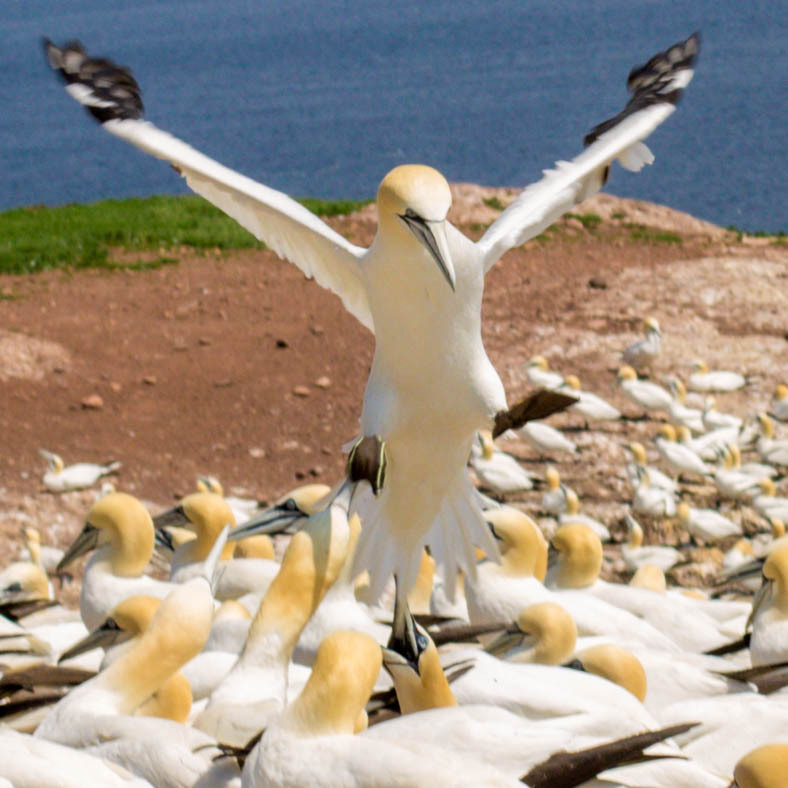 Northern Gannets are not small, nor are they particularly co-ordinated on landing. So we spent a great deal of time mesmerized by the flow and drama within the colony. And the rest of the time laughing as the birds seemed to literally crash into a sea of other birds as they attempted to land. Pro-Tip: The boat tickets allow you to stay on the island for as long as you want. Just be sure to catch the last boat back (5 pm) to the mainland as there are no accommodations or camping on the island. After having our fill of watching the bird colony, we took the same trail back to the visitor’s center. We had some time before our ride back to the mainland and used that to wander through some of the abandoned houses on the island. Until 1971, there were 35 families residing on the island. However, the land was expropriated by the Quebec government who wanted to turn it into a national park. After exploring, we headed over to the restaurant, which was housed in one of the original farm houses, to have a snack while waiting for the next boat to arrive to bring us back to mainland Percé. There are several ways to explore Bonaventure Island and Percé rock. If you prefer to view both from the air, the entire Gaspesie region can be seen on a helicopter tour. These include views of Bonaventure Island and Percé rock as well as the rest of the Gaspé peninsula. The other option is to view the peninsula via boat cruise. The tours of Bonaventure island usually include Perce Rock as well. Pro-Tip: Low and high tides times can be easily found by visiting the tourist center located in the city or checking the online schedule here. 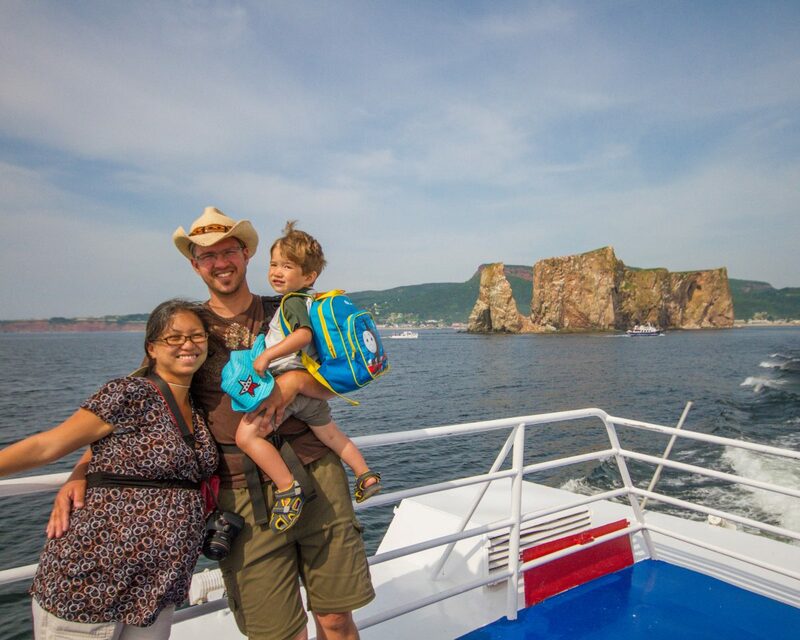 here are two boat tour operators in the area that explore the National Park of Bonaventure Island and Percé Rock. With all the madness early in our road-trip, we didn’t book our boat tickets in advance. Instead, we headed to the tourist office to find out more about the companies. 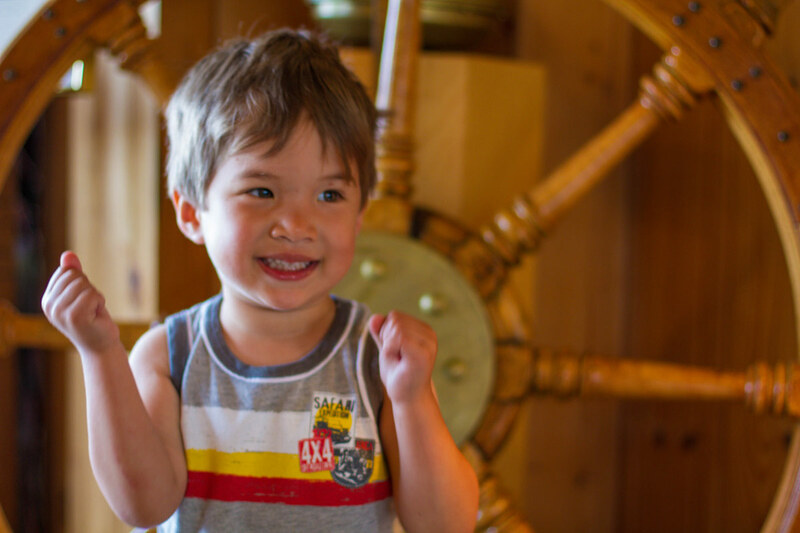 We decided to go with Les Bateliers de Perce as the tour times gave us the best opportunity to explore the island. They offered a combined tour of Bonaventure Island and Percé Rock. The boat cruise takes off from the Percé wharf and heads straight for Perce Rock. During high tourist season, there are hourly departures. The cruise circles Perce Rock for about thirty minutes giving you plenty of opportunities to admire and photograph the rock from various angles. The boat then heads over to Bonaventure Island, a migratory bird sanctuary. Before heading to the island wharf, however, the boat stops briefly at the northeastern section of Bonaventure island which has an exposed 75 m cliff. If you are lucky, you will catch a glimpse of some of the many seabirds that migrate to the area on the ledges. The waters are also full of marine life. 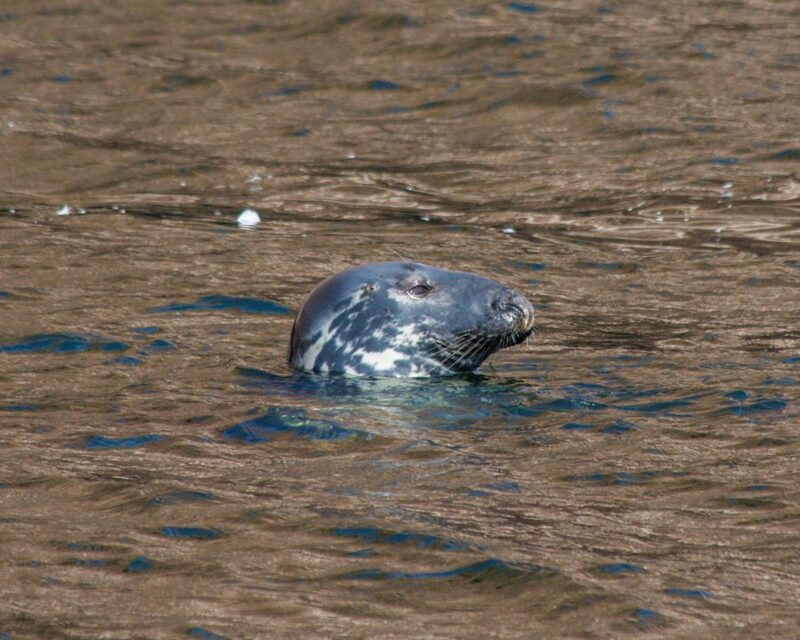 We spotted several grey seals! Pro-Tip: It is also possible to sign up for a whale watching cruise in the St. Lawrence. Marine life that has been spotted in the area includes grey seals, fin whales, minke whales, humpback whales, blue whales, white-sided dolphins, and harbor porpoises. We opted not to do the whale watching cruise as we had just partaken in one earlier in the week. In peak season Perce is a booming tourist town. The restaurants and hotels in Perce can book up very quickly. But a visit here is worth it. The Perce itself is incredibly beautiful. 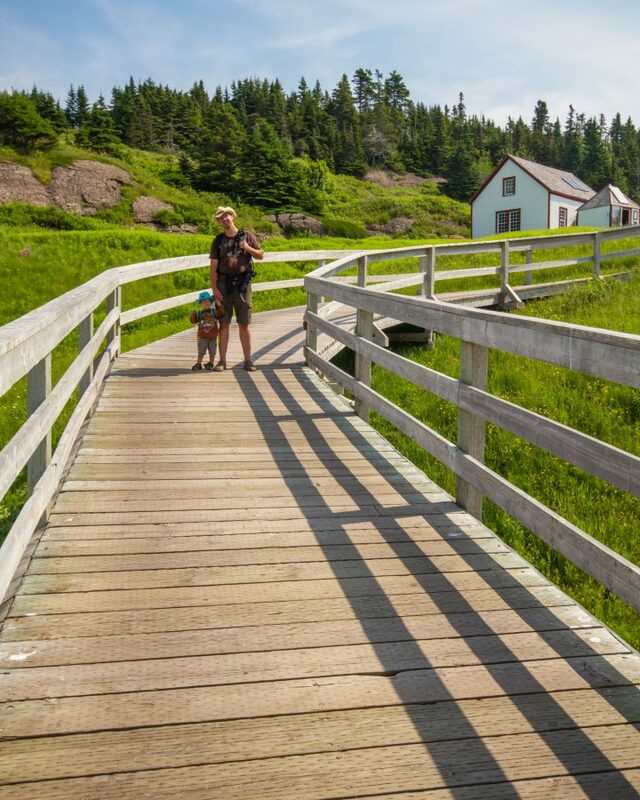 Even without Bonaventure Island and Perce Rock, it is easy to see why so many people visit every year. 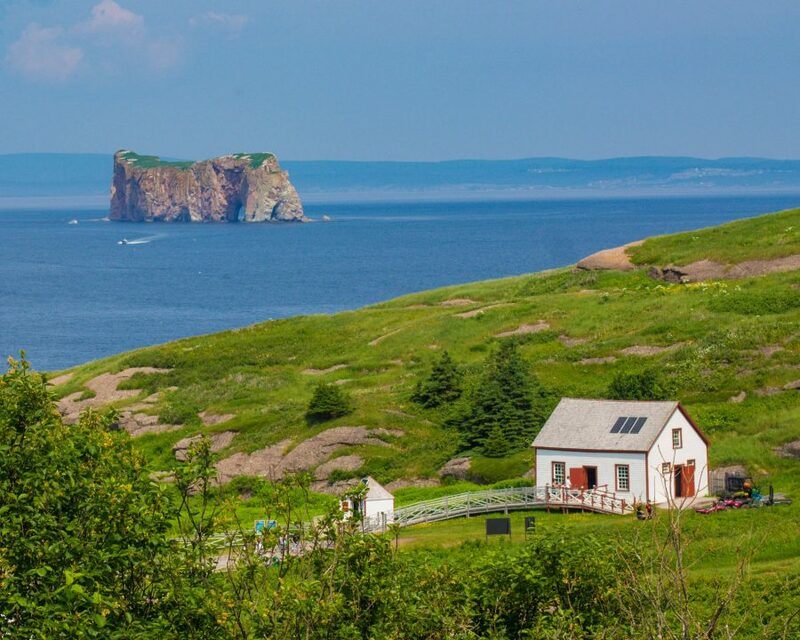 And from luxury to camping, there is a wide selection of places to stay in Perce, Quebec. Cabin or Chalet rentals. After our transmission blew early in our trip, I had had my fair share of camping. 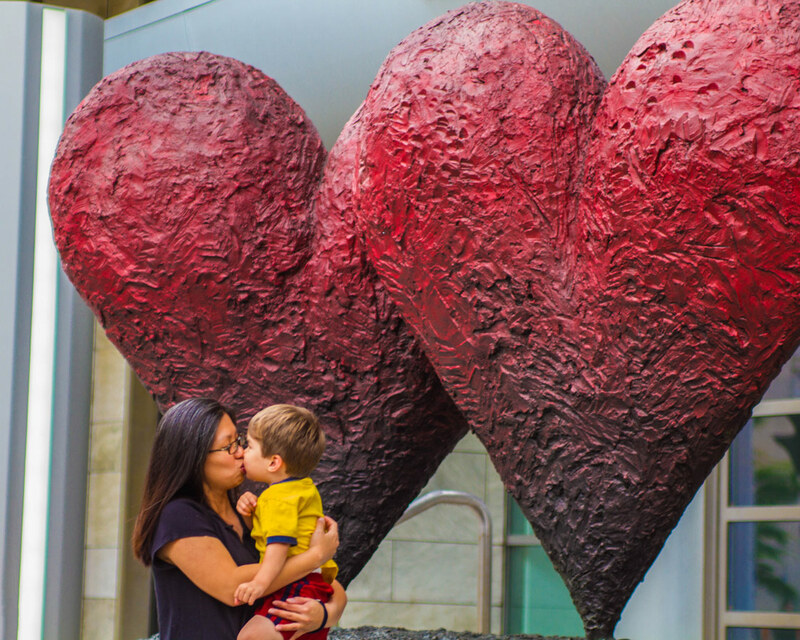 I had been forced to sleep on the ground (while 8 months pregnant) for three nights. So we opted for the latter as it afforded some comfort. The bonus was an absolutely spectacular view of the St. Lawrence River. And the coast of the Gaspé peninsula including the National Park of Bonaventure Island and Percé Rock. The chalet was equipped with a nice picnic table where we made sandwiches for dinner. This allowed us to fuel up for the next day where we would be exploring the National Park of Bonaventure Island and Percé Rock. There a number of other excellent establishments in the area. You can check the prices and availability here. If you are booking dinner reservations at one of the many local restaurants with a view, make sure to check for the sunset hour, sit back, grab a glass of wine (or, due to my pregnancy, sparkling grape juice) and watch the light show. 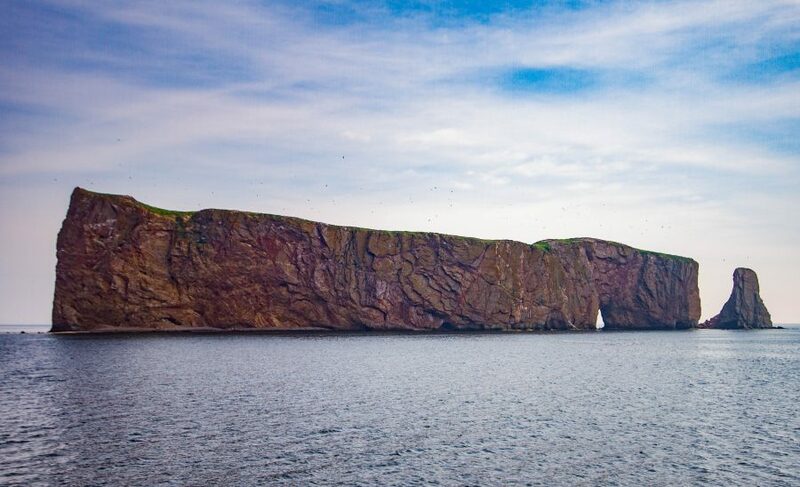 Catching the view of Percé rock, which was formed on the bottom of the ocean bed 375 million years ago, will stay with you for a long time. Located just outside of town on the shores of the St. Lawrence, La Maison-Pecheur offers a great selection of seafood and gourmet fair. The building lives up to its name, having all the charm and styling of an old fishers house. And the deserts lived up to everything that C was hoping for. What an adventure! The landscape and wildlife are stunning aren’t they? Heaven for children to explore in the great outdoors. First of all, bonus points to you for sleeping on the ground at 8 months pregnant! Sorry to hear that you guys had so many challenges getting to Bonaventure Island and Percé Rock, but it sounds like once you go there you saw some pretty incredible sights. The boat tour sounds seems like an ideal way to see it all. What a lovely place and as usual your adventure comes to life in your post. I loved the cute little Chalets and am intrigued by the fact that the Perce rock is 365 million years old! You have captured some wonderful moments at the Bird Colony. Simply amazing! What a beautiful setting! That image at the top of this post is picture postcard perfect, and the rock looks awe inspiring and deserves to be referred to with a definite article 🙂 Great capture of the gannets at the bird colony too! Wow it looks so peaceful and quiet. Really just nature and no fuss. Thanks for the tip. You photos are striking beautiful. I just have to say I was happy to see another post about places in or near Quebec. That city is moving to the top of my bucket list, and I am really excited about all there is to see and do there. I’m definitely going to go visit! Your pictures are spectaclar (especially yhe birds), and your descriptions quite detailed. I sure appreciate you sharing your experience with everyone! Wow! What a nice place with natural beauty and plenty to do. This sounds like it’s right up my alley! Thanks for sharing! I would love to see the bird colonies – they look so beautiful and unique. Your little guy is such a trooper, walking all that way! Also, if you wouldn’t mind sharing, what plugin do you use for your maps. I really like it! Your 2-year old kid walked the entire trail? Impressive. Most kids would fuss and just ask the adults to carry them. It looks like he has the travel DNA just like his parents. I’ve never been to Quebec but it sure looks beautiful and I’d be happy to go there myself someday. Awesome adventure! the birds are super beautiful with the yellowish head and the blue beak! Very beautiful and relaxing place! What a beautiful place! You got some pretty great pictures here, and I love the sight og The Rock. Those chalets look so cute – they remind me of Switzerland! This sounds like a great trip to admire the geology and wildlife – as a geologist by training I love how you got all the details about the rock in here! Sounds like a wonderful place to visit and the chalets look lovely for famillies. I love the pics of the bird colony. What an experience for children! Those are some really neat photos. I’ve never heard of this destination before, but it’s really cool to read that you can walk to the rock at low tide! I must admit that I never heard of Percé before despite having visited the province of Quebec at least a half dozen times. It looks really lovely and quite the contrast to the cities of Montreal and Quebec City. Love, love, love! This place is a dream! Thanks for sharing, such an inspiration. I’m absolutely blown away by the beauty of Quebec. One of my good friends is from there and I’ll have to have her show me around. I especially loved the picture of the seal! These pics are awesome. Canada has so much natural beauty and so many secret places to explore. Ahh Bonaventure Island looks like so much fun! The trail looks gorgeous! Some of my favorite travel memories involve seeing local animals and birds. 🙂 Thanks for sharing! What an absolutely breathtaking place to visit! 🙂 The Des colonies trail looks so beautiful! You know, Canada has never really been on my travel bucket list, but I think I need to revisit that! I didn’t realize how much natural beauty there is to experience there. The photos do it justice, I can’t wait to explore more of Canada especially the east side. It’s so cool you got to see some seals! I love seeing local wildlife when I visit an area. Thanks for reminding me that I really need to get back to Quebec. 10 years is too long! Sleeping on the ground while 8 months pregnant, you’re a champ! That picnic table looks perfect for breakfasts overlooking the gorgeous landscape. Haven’t been to Canada for a while, this was a good reminder of how beautiful it is. This part of Canada looks beautiful. It makes me wish I had explored around more when I lived in Buffalo, NY, and was much closer than I am now. I’d love to see “The Rock” when I go there! My home base is in Toronto, so I’ll definitely consider it for a future road trip! The scenery looks so tranquil! I’m so impressed you take such adventurous trips with a two year old! You are an inspiration! That’s a really interesting island. So beautiful. The helicopter tour sounds really exciting!! The more I see of Canada the more I want to get there NOW! You’re pictures are stunning… I especially like the gray seal! Wow, thanks for sharing this. We would love to explore this island at some point! Wow! Seems like a great place to see wildlife. 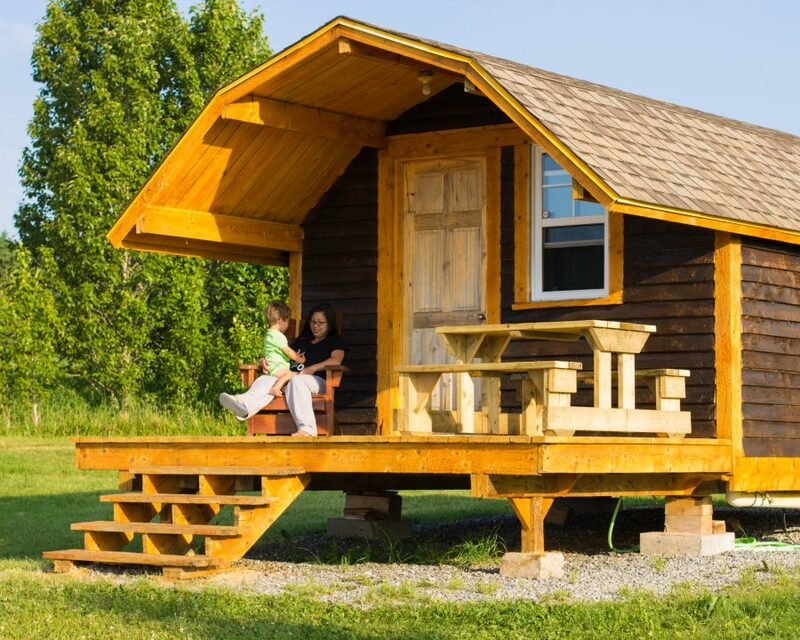 And those little cabins you stayed in look like so much fun! I’m going to have to add Perce Rock to my list of things to see in Quebec. I really want to get there soon. The chalets and camping look like a great way to see and enjoy the natural beauty. Always love reading posts about Canada!!! Such a beautiful and varied place! I’ve never really thought about visiting Quebec. Maybe I should. Your photos are incredible! I’d love that oceanfront view! Okay, I’m sold! Bonaventure Island is going on my list, this place looks stunning. Great post, thanks for sharing. Wow, I can’t believe how much this place reminds me of Ireland! Amazing photos. I love the photos of the seals and the bird colony. Canada is such an amazing and diverse country. And it’s very impressive that your two-year-old son managed to do so much walking! I really need to do more traveling in Canada! I’d love to see the grey seals and Northern gannet colony. Thanks for this wonderful post. It made me remember how much we enjoyed visiting the Gaspe Peninsula. It’s been far too long since I was last there. I love your gannet pics. They’re so photogenic! “Bonaventure” – it, rhyming with adventure, is tell-tale sign that it’s a good fun! Awesome nature and wildlife photos and superb storytelling you got here. Kudos! Props to you for sleeping on the floor at 8 months pregnant! And you got some amazing photos – the nature and the wildlife are incredible! What a great family trip! My kids would enjoy seeing the seals and Northern Gannets. Quebec doesn’t get enough attention beyond the cities (nor does Canada in general), so it’s nice to see someone find some of the natural beauty there. Good for you guys for venturing outside the urban. Looks stunning and such a cool adventure. 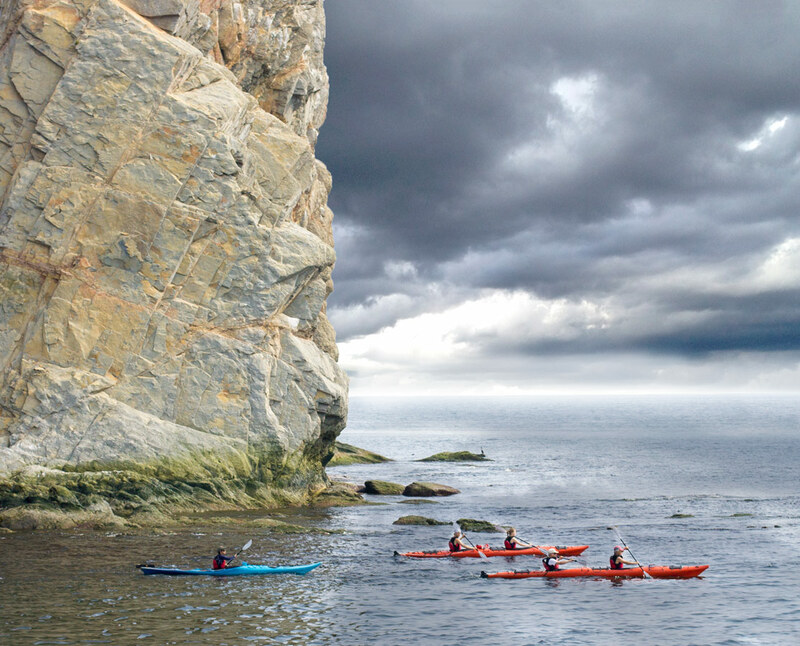 I’d love to kayak close to the rock and see the bird colonies. You had sunshine too! I hope for the same. Well that’s the nature that Canada does so well. These chalets are so cute! I love going to places where there are lots of wildlife. I guess, this is just the place. I am heading to Canada soon and now I will look into this place. Beautiful photos! It looks like you had a wonderful place to stay and picnic at as well! I never considered visiting Canada until this year I have read so much about it I don’t know where to start! Thanks for letting me know about something else to add to the wish list. Hopefully, I can make it to Canada soon. Despite all the challenges getting there, it seems like you had a great time after all. The photos are amazing! Beautiful pictures! Seems like you guys had a blast! The bird life and scenery looks fantastic. Great place to relax for a bit. I like you have to take the boat to get there. Seems like a great place to see wildlife. the pictures are just awesome! Awh that photo is so cute! This looks similar to one of my favourite places in the UK called Trebarwith Strand in Cornwall. It’s amazing to see that not ALL holidays are just lazing on the beach or city escapes but an epic adventure. Very impressed that you went camping whilst 8 months pregnant too! It shows your spirit for the outdoors ha-ha! I love the way you write about this topic. Bonaventure Island is my favorite place and the information i got about it is amazing. It’s great to hear from another who’s been there. It really is such a cool place! Wow! What spectacular photos of Quebec! I will definitely put it on my bucket list.